I have had this recurring dream in the past few years, that I would encounter Rick Steves and his team in the East Corridor of the Uffizi Galleries, and that I would run over to to them, shove Rick and his fanny pack well out of the way with great conviction, then the grab the camera and point it at the ceiling. Yes the Uffizi is crammed with fantastic Italian art, but if you don't look up once in a while, you are missing something truly special. 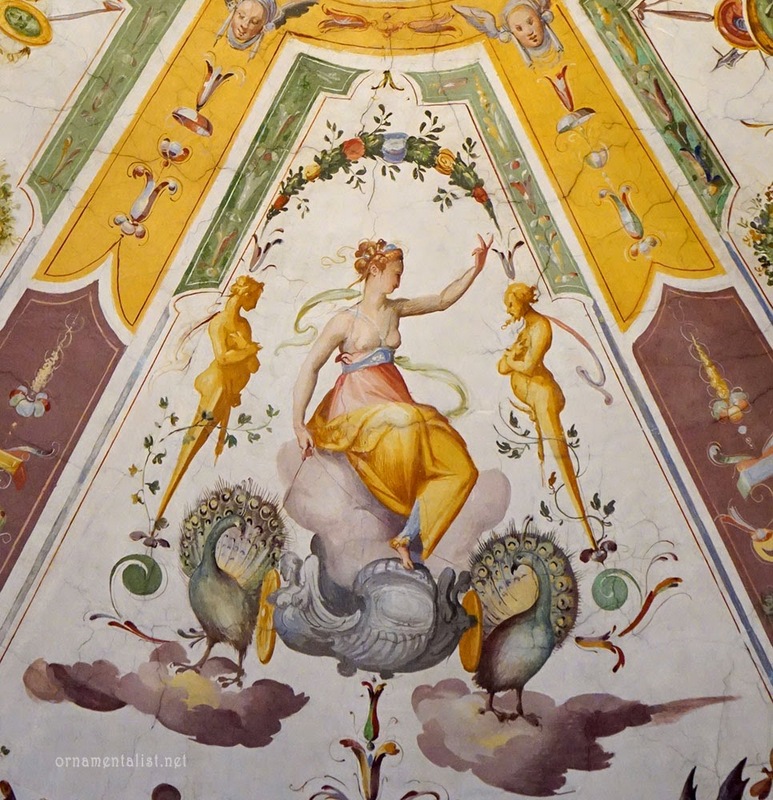 Last year, I spent three months in Florence, and as a card-carrying member of the Association of Amici degli Uffizi, which has helped fund the restoration of this and other areas of the museum, I made numerous trips to study my favorite quirky ceilings, and it is still one of the first places I go whenever I return there. Photography is allowed in this famous museum (as of May 31, 2014) and so I am thrilled to be able to share a sampling of these images from my most recent visit. 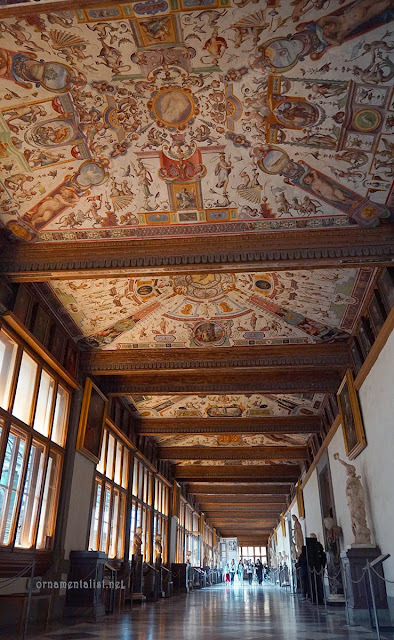 The East Corridor ceilings were frescoed in 1580-81 by Alessandro Allori and his team of decorative painters, in a high Mannerist spin on the popular grottesche style of ornamentation. 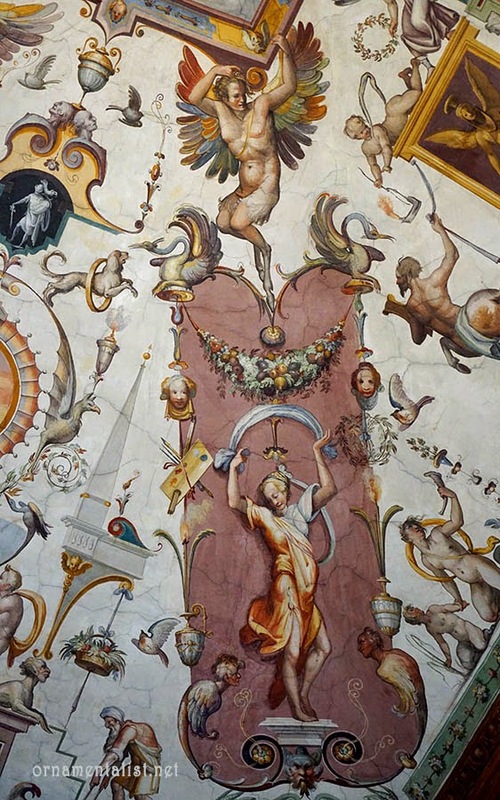 Each ceiling section features a different theme and unique color scheme, as well as a wealth of ornament and figural elements ranging from the charming to the bizarre. Too easily dismissed as silly decoration, a careful look at any of the details reveals a spirit of discovery, and an almost frantic catalogue of the knowledge and concerns of the times. typical layout of each of these Uffizi ceilings: grottesche arranged symmetrically around a center element. 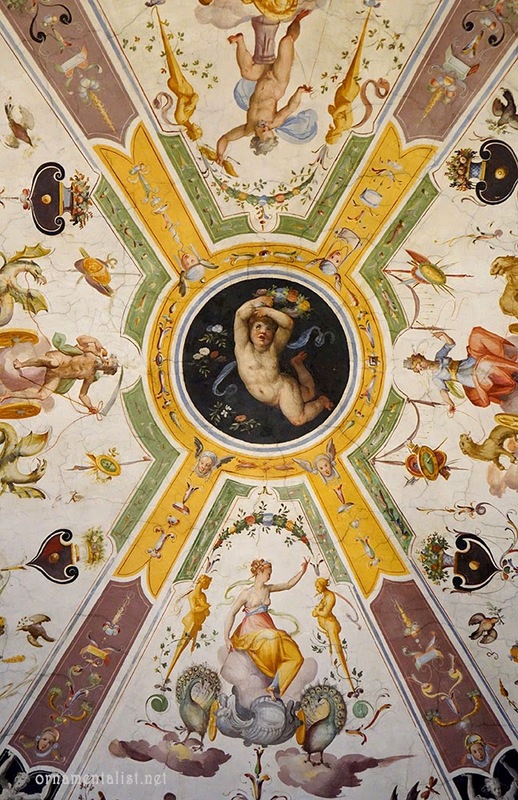 The ceilings are painted with intense and beautiful colors on white plaster, and remain light and airy despite the busy compositions, all of which follow a similar arrangement: an X that connects each corner to a central element, while other designs are arranged in pairs symmetrically on either side. 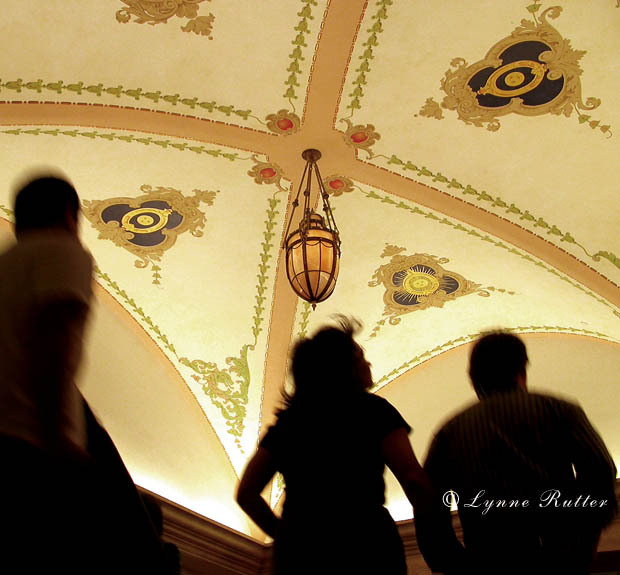 (These ceiling sections are shallow coves, the designs would work just as well on a flat ceiling.) Mythological creatures, allegorical and humorous figures and animals populate a framework of garlands, borders, fans, piers, and cartouches with landscapes or narrative scenes. Some themes are serious or religious, but the overall effect is that there is a huge party going on overhead. Like a giant thought bubble, brimming with ideas. Grottesca ornament remained popular in Tuscany long after the Baroque took hold in other areas of Italy. 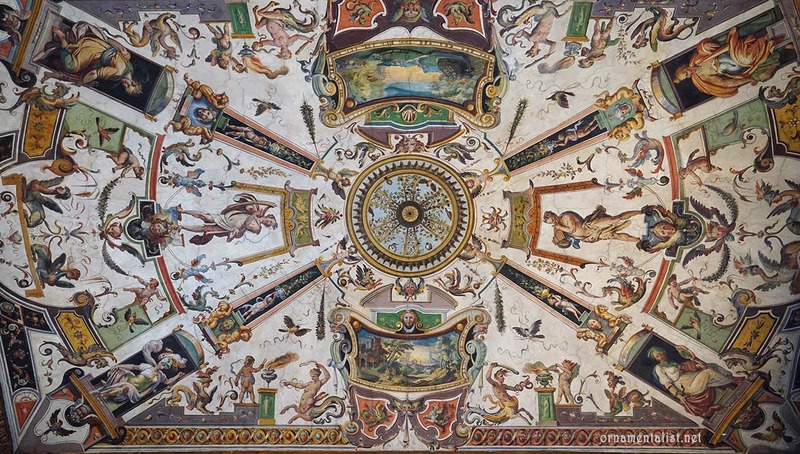 This group of ceilings represents the very height of the Florentine grotteche style, incorporating the colors and techniques of Mannerism and all the references and interests of the Medici era. 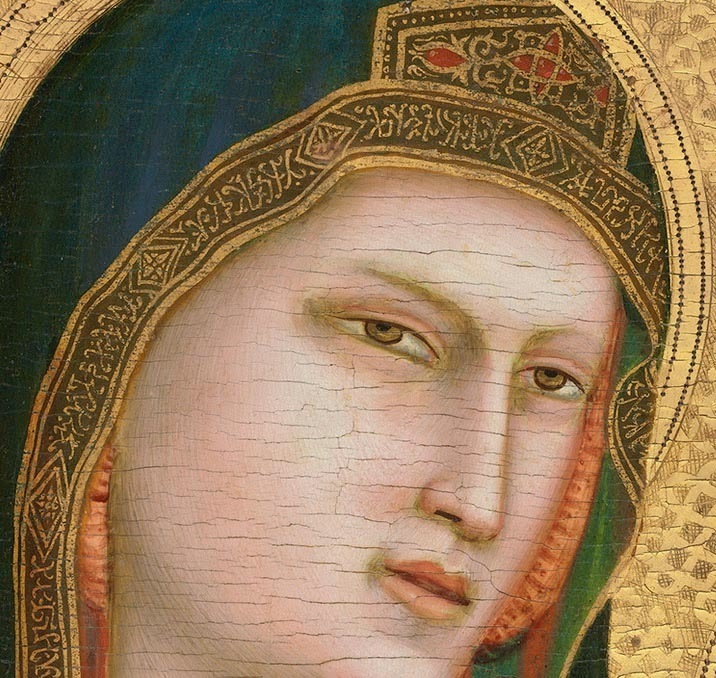 I am desperately in love with the gamboge yellow pigment used in this painting. Florence can be exceedingly crowded especially with busloads of tourists who come in just for the day. Yes, you may make a reservation to get in but then you have to share the museum with a million others all shoving each other to get a glimpse of the Birth of Venus. Let it be known those people follow their tour guides out and get back on the bus by 5 PM. 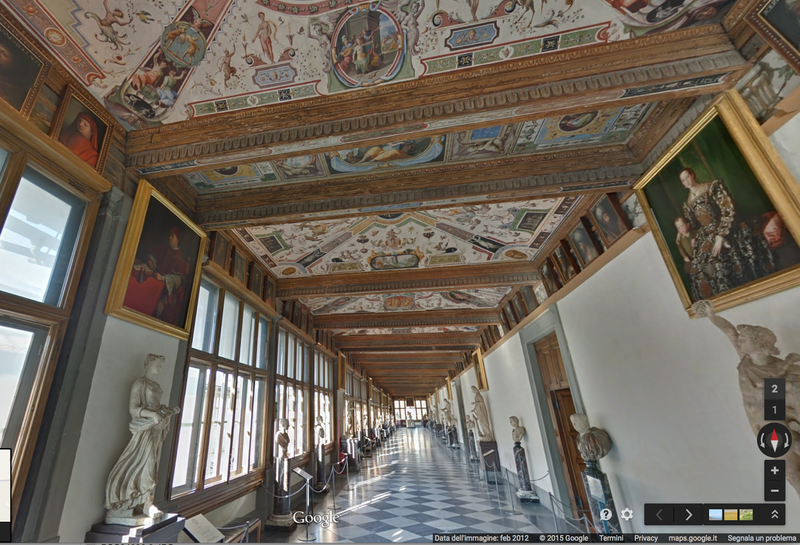 If you hate people are agoraphobic like me, this is the BEST time to go visit the Uffizi. No line to get in, no people in the galleries. Enjoy a blissfully empty museum for two hours. Stroll through and experience what you like, and don't worry about seeing it all in one go. Take note of special hours and free admissions times. The Uffizi has added special hours several days a week to help reduce crowding. The Uffizi Gallery, the Accademia Gallery and the National Museum of the Bargello will remain open late some evenings in the summer months. 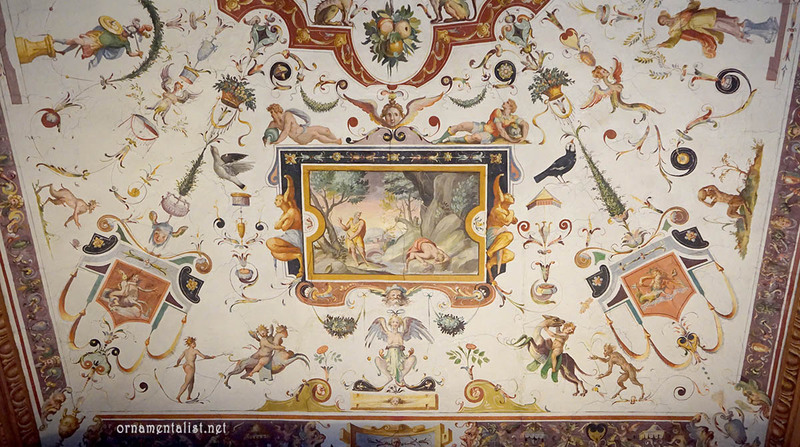 Check the Uffizi website for hours and special events. If you plan to be in the area more than just a few days, consider joining the Friends of the Uffizi. This membership gives you for an entire year, unlimited front of the line admission to the Uffizi as well as all the other State museums in Florence including the Pitti Palace and the Bargello, while supporting restoration efforts. With a pass like this you can go by for a stroll through the Uffizi every day (except Monday) on your way to your favorite enoteca. Great post- can't wait to get back there and add to my collection! So nice not to have to duck the guards and especially the hyper-annoying tour guides! We should team up! It's an enormous amount of work to shoot all of it as there are SO many great details! I barely got through the one corridor before my neck started objecting. Fortunately it was after 5 and the place was nearly deserted! Alas, when I visited the Uffizi photography was not permitted, and I got a scolding for trying to take a picture of sculpture. I guess another trip is in order. Yes the museums have all finally realized that their employees have far better things to do than police all the cell phones and snapshots that people might sneak. And all of this stuff is on line already anyway. I still think many people trade a real nice experience with a work of art for a quick snapshot, but at least the selfies sticks are prohibited, thank goodness. Wow! thanks for that link, Jo! I shall have to try to visit this place! I loved this article and look forward to reading the others linked at the bottom. Thank you so much. I have always admired the creativity in these imaginative "decorations."